"A burger with a fiery twist! The classic cheeseburger gets a tasty update with the addition of GOYA® Chipotle Peppers in Adobo Sauce. These chipotle chiles are jalapeno peppers that have been dried, smoked, and then packed in a flavorful sauce made of tomatoes and other spices. Here, we add these special peppers twice--first to the mayonnaise, which gets spread on the buns, and then mixed into the meat before its grilled. And don't skip the red onions and tomatoes: they add a sweet, crisp bite." In medium bowl, stir together mayonnaise, 1 tbsp. chipotle sauce, 1 tsp. garlic, cilantro and adobo; cover and refrigerate until ready to use. In large bowl, gently mix together beef, chopped chipotle, 3 tbsp. chipotle sauce, remaining garlic and adobo until combined. Divide meat into 6 portions; form into 1 inch-thick patties. (Take care not to over-handle meat or else it will toughen). Prepare grill to medium-high heat, grease with oil (or heat oil in medium skillet over medium-high heat). Cook burgers, flipping once, until charred and cooked to desired doneness (about 12 minutes total for medium rare). Add cheese to patties about 5 minutes before taking them off grill. To assemble, divide patties evenly among bottom buns; top with onion slice, tomato slice, lettuce and top bun spread with reserved chipotle mayonnaise. Perfectly Seasoned Meat  Every time! You added GOYA® Adobo All-Purpose Seasoning the burger meat, but since the beef is still raw, you can't taste to see if the seasoning is to your liking. The easiest way: Scoop out a spoonful of meat, form into a small hamburger shape and cook on an oiled skillet until cooked-though. Then, taste and adjust. I didn't like these. I think it is the chipotle. I guess I'm not a fan of that pepper. My husband thought they were okay, but I will not be making these again. Absolutley delicious! A must try if you like a great burger!! 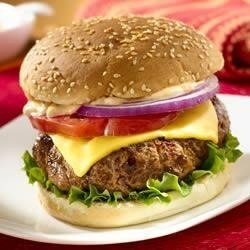 Really good moist burger! Love the addition of the chipotles for a nice kick. Very good recipe. Didn't make the chipotle mayo (don't like mayo). Topped with avocado in addition to the other veggies. Also subbed ground chicken for the beef.